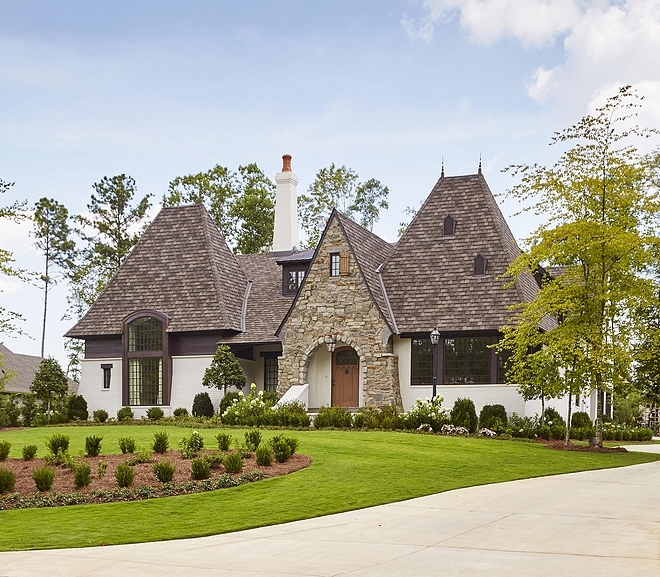 With architecture by Christopher Architecture & Interiors, this French-country home is in the Moore’s Mill Club neighborhood in Auburn, Alabama. 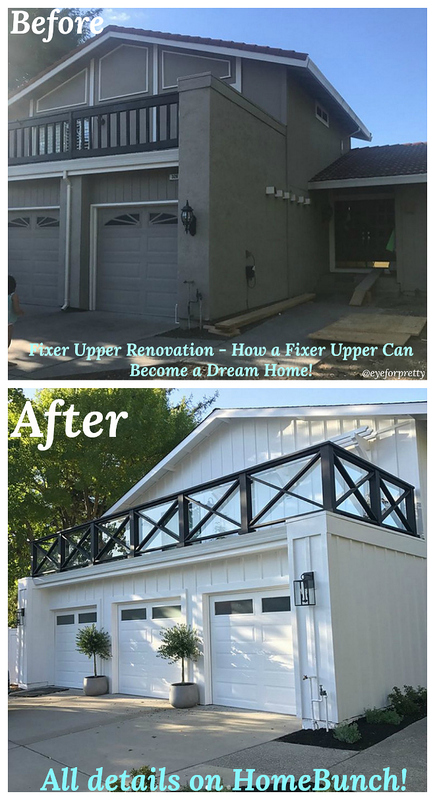 The client wanted an inviting and effortless space that would also be stylish and unique. They were drawn to the architect’s ability to blend contextual elements and create homes that are beautiful and elegant. 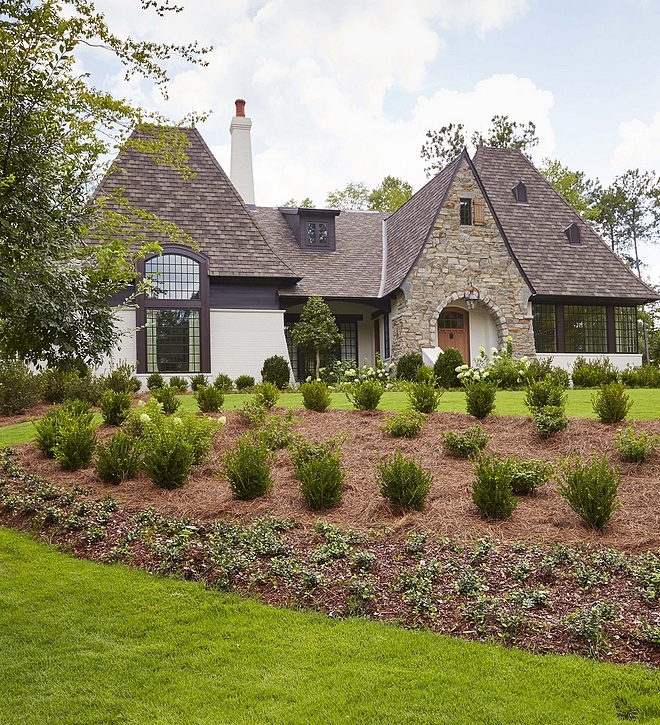 This home was built for a family of four, and the family wanted it to be a great home for entertaining, since Auburn is a college football town. The home was designed to include private quarters for the family on each end of the home and a large public space in the center for entertaining. Definition of space was created by varied ceiling heights and cased openings that helped transition from room to room. The house was designed in a “U” shape to create a back porch and courtyard behind the house. Architectural Heritage, Terracotta Chimney Pots. The black windows are Lincoln Windows. 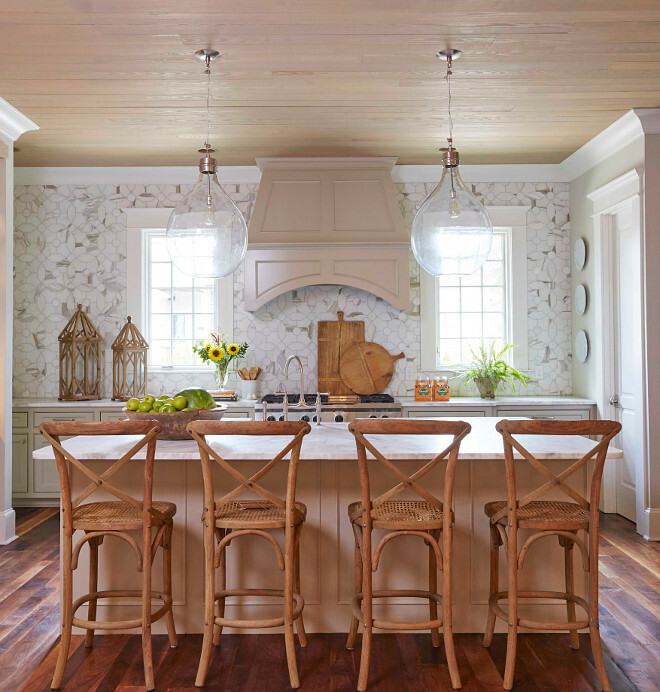 When it came to the interiors, the homeowners aimed for simple sophistication with a neutral color palette and natural elements. Paint color is Benjamin Moore 1529 Stingray. Living room ceiling features hand-hewn cedar trusses and washed-pine boards. 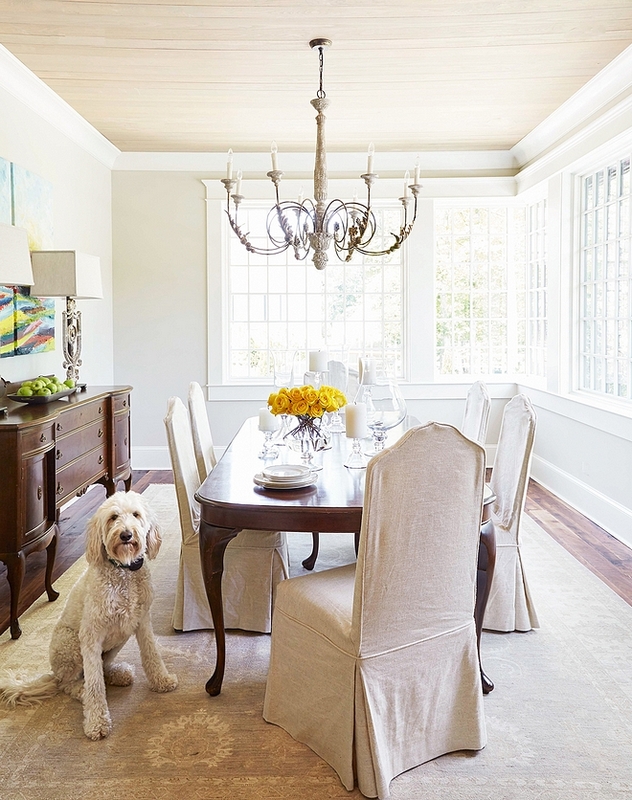 Chandelier: Lowcountry Originals Spring Island Basket Chandelier – Similar Here & Here. Similar Rug: Here, Here, Here, Here & Here. Coffee Table: Here, Here & Here. 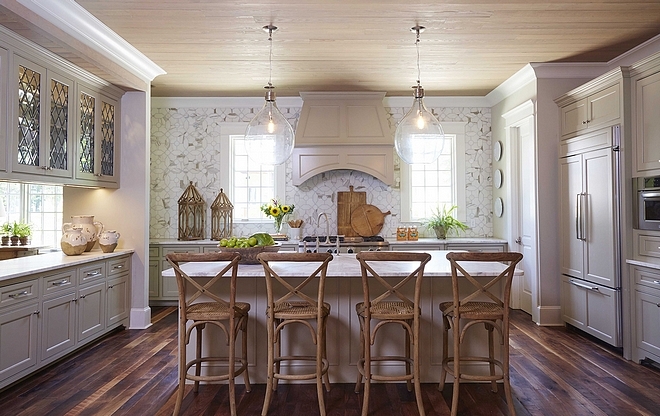 This stunning pale gray kitchen features washed pine ceiling. 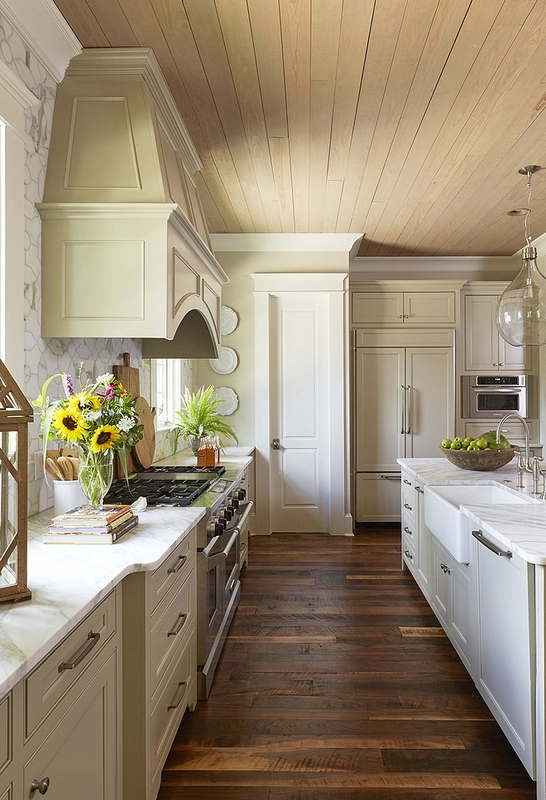 A custom-designed leaded glass cabinet, separates the kitchen from the breakfast room. Counterstools: Restoration Hardware – similar & more affordable! Here. Grey Kitchen Cabinet Paint Color: Benjamin Moore 1530 Senora Gray. Flooring is hand-scraped Walnut hardwood floors. Cabinet Hardware: Pulls & Knobs. Oversized Glass Jug Pendant: Here, Here, Here & Here. 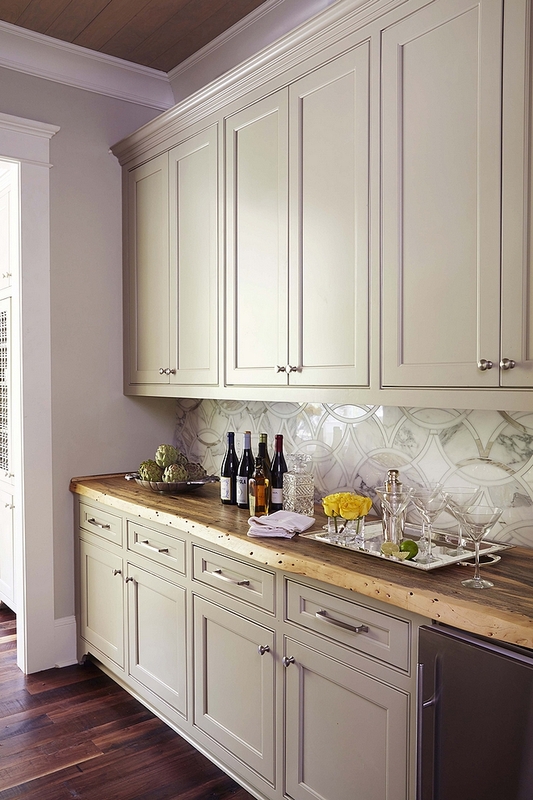 Backsplash: Ravenna- Chatham 2 – Similar Here, Here & Here. Wooden Boards: Here & Here. 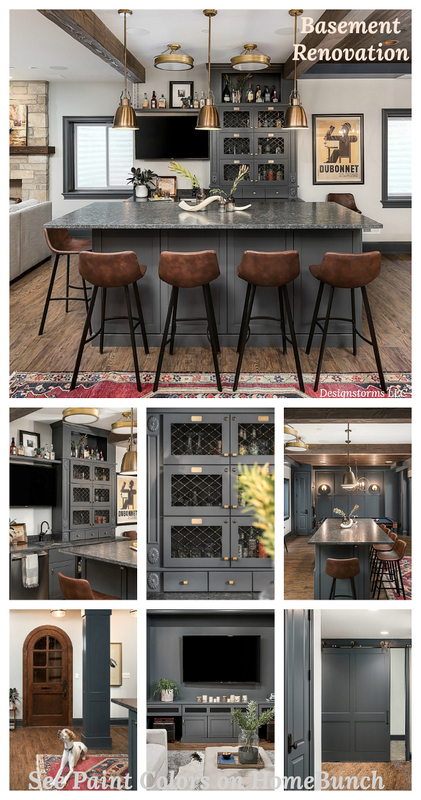 This stunning butler’s pantry features grey cabinets, painted in Senora Gray by Benjamin Moore and live edge countertop. Backsplash is the same used in the kitchen. The dining room is warm, inviting, and comfortable and there’s nothing pretentious about it. Chandelier: Aidan Gray. Similar: Here, Here & Here. Wall color is Stingray by Benjamin Moore. Similar Neutral Rugs: Here, Here, Here, Here, Here, Here, Here, Here & Here. 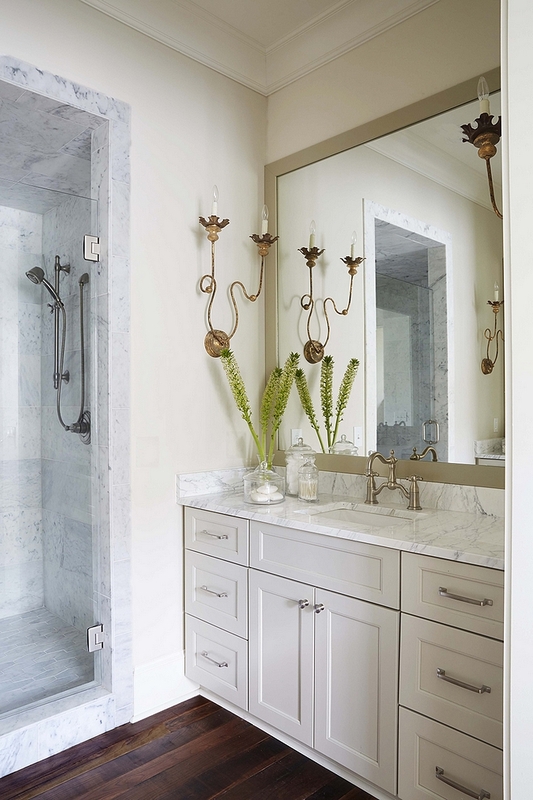 This gorgeous bathroom features some timeless details such as white marble countertop, soft grey cabinets and hardwood flooring. Trim Paint Color: Benjamin Moore OC-45 Swiss Coffee. The back porch features a Firerock fireplace and Bluestone floor tile. 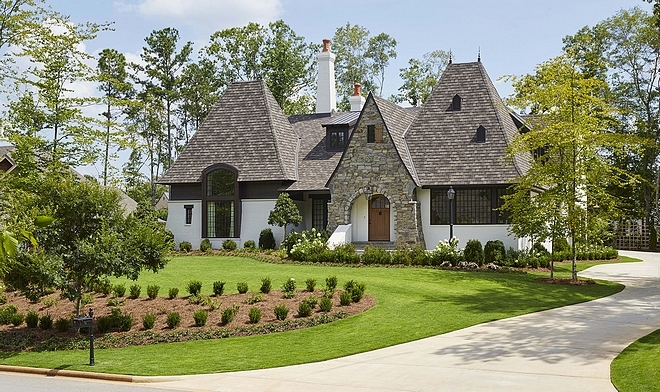 Exterior Details: Copper craft gable top dormers – Copper flashing and Copper craft spires. 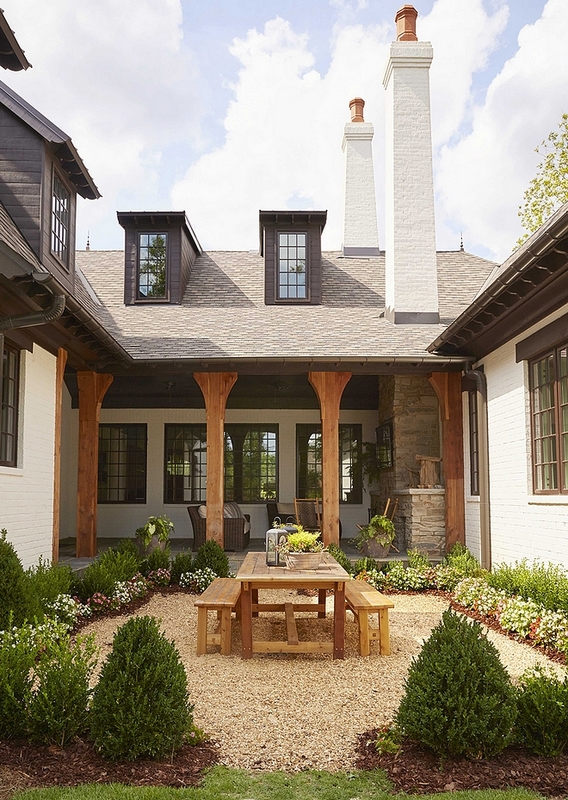 The “U” shape of the house created a cozy back porch and courtyard for the homeowners. 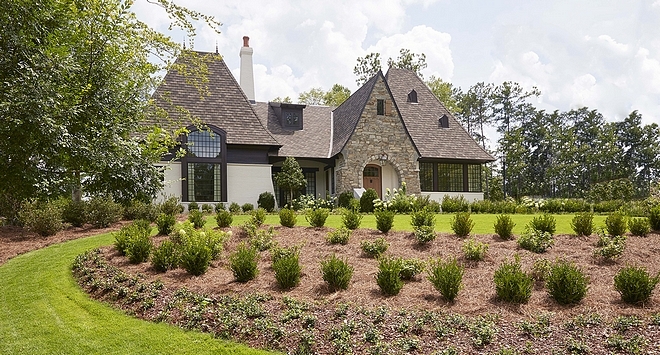 Brick Exterior Paint Color: Benjamin Moore Oyster Shell. Exterior Brown: Benjamin Moore CSP-30 Espresso Bean. 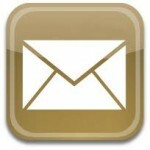 Architecture: Christopher Architecture & Interiors – Chris Reebals. (Instagram). 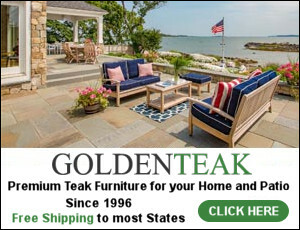 Wayfair: Up to 70% Off Annual Upholstery Sale! Pottery Barn: Up to 40% Off on Selected Rugs, Lighting & Bedding! West Elm: Up to 30% Off on Rugs & Furniture. New Spring Arrivals!!! 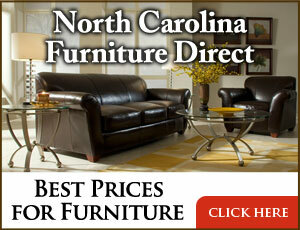 Serena & Lily: 20% Off on Custom Furniture. Use Code: COMFY- New Pillows & Rugs! Horchow: New Spring Arrivals and Many Sales!! One Kings Lane: Save Up to 70% OFF! Warehouse Sale! Williams & Sonoma: Up to 50% off. Pier 1: Up to 20% Off Purchase. Joss & Main: Up to 75% OFF!!! Florida Beach House Interior Design Ideas. New Construction Modern Farmhouse Design. @camitiffin: Beautiful Homes of Instagram. New 2018 Family Home Decor Trends.